From looks to functionality, a kitchen island contributes immensely to your cooking space. You can use it as a sitting and eating area, as a workspace, or for storing goods. In fact, if you have a kitchen island with storage options incorporated with it, you can maximize its utility. It’s great when your cooking space has limited cubic feet. 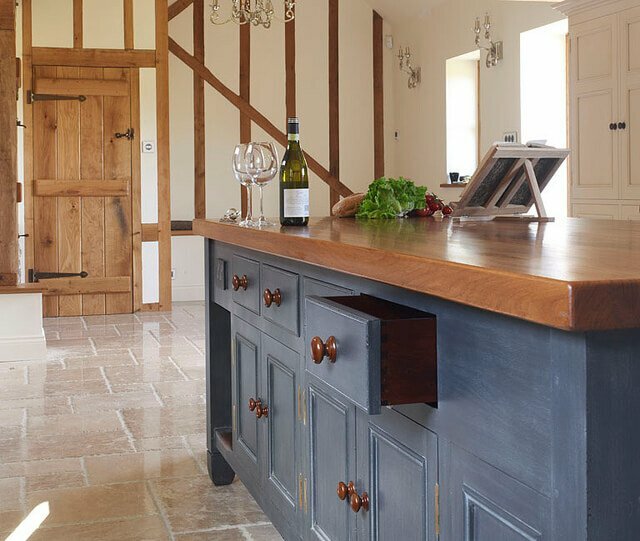 So today, let’s check out some of the cleverest ‘kitchen island with storage’ ideas that you can implement in your next kitchen renovation project. 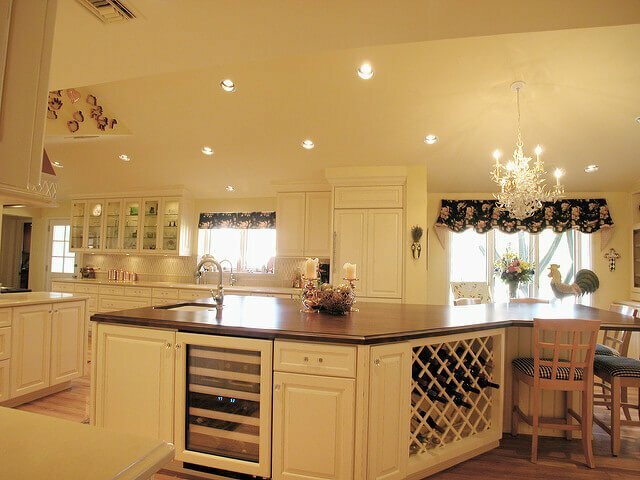 In the arrangement above, you can see how both the upper and lower areas of a huge kitchen island have been used to their maximum potential. With a built-in sink and a drawer-style microwave, this is an example of genius space utilization. 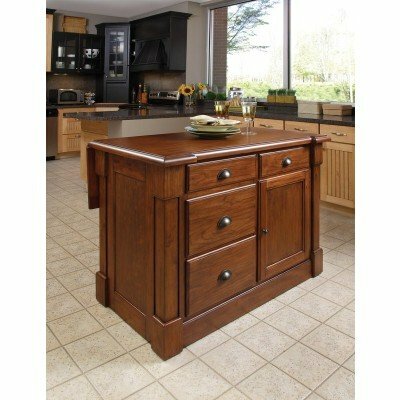 Moreover, there is so much volume on the countertop that you can use it for serving food and placing other essential items. Tuck in some stools and you can convert this into a multi-purpose breakfast table. 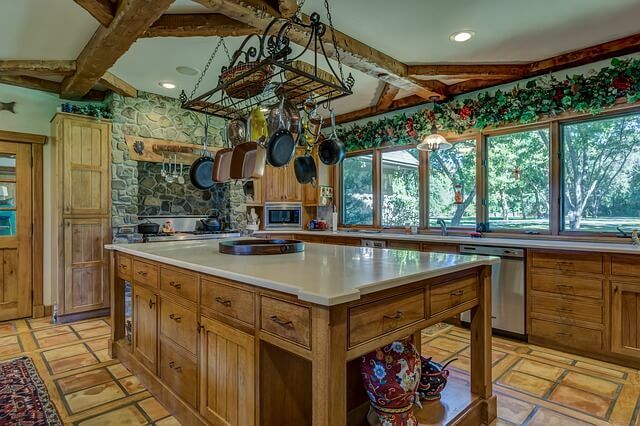 This open island — with a breakfast bar as well as a large eating area — lends a light appearance to your kitchen. The wide shelves can be used to store essentials such as towels, utensils, and cooking supplies to contain kitchen clutter. Place a few decorative accessories and the whole layout will look extremely striking. This versatile kitchen island brings together awesome looks and functionality in a single genius design. An inbuilt sink preps it up as a working surface while several drawers offer ample storage options. Cleverly carved open shelves hold beautiful decor items visible from the dining area — with a similar color palette — located close to the island for convenience. And do you know what’s the icing on the cake? The entire unit can be moved and positioned according to the layout of the kitchen and its design. Multiple wide drawers work wonders when you want to store several items such as dishes, linens, pots, and pans. Although this kitchen island with storage looks small, its unused area — below the counter space — has been used to the maximum. Even the wood utilized is so sturdy that the drawers can hold heavy items as well. This compact and small island — with an expandable top — is a wonderful space-saving option for a cramped kitchen. One of our favorite kitchen island with storage ideas, this creative arrangement features a cooktop — inserted into the island itself. Cook food and serve it hot on the seating area — located at the other end. A number of drawers installed below the stove offer you the convenience of storing cooking essentials — that too within easy reach of your hands. 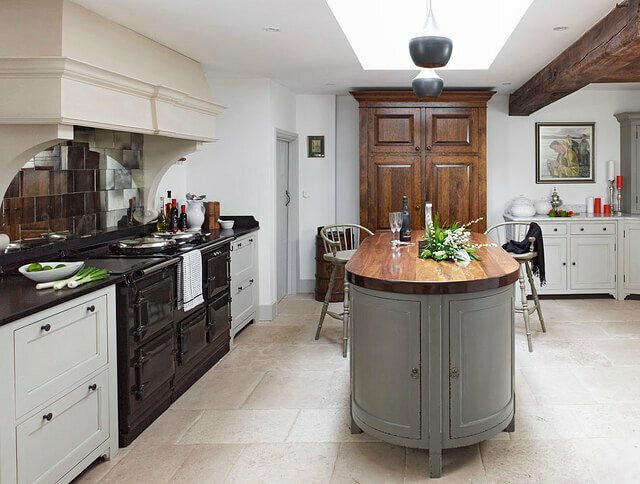 An extension of the above idea, this huge kitchen island also houses an inbuilt cooktop and chairs at the other end — converting it to a 3-in-1 space. How? You can cook, eat, and store items in a single island. Big cabinets below the counter area will store several utility items — freeing you of clutter. Matching cabinetry and woodwork lend the entire space a cohesive appearance. 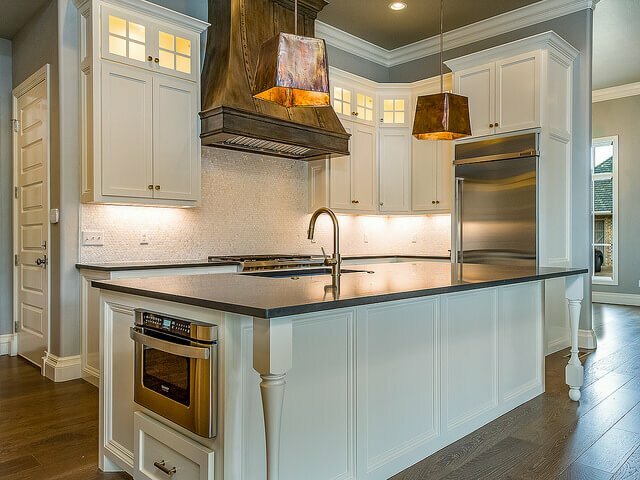 Exuding elegance from every corner, this amazing country-style kitchen island features a golden-toned granite counter surface — beautifully complementing the pendant lights above. The curved overhang has space to comfortably fit in 3 bar stools and the top has an inbuilt a double sink and dishwasher — doubling up as a workspace. 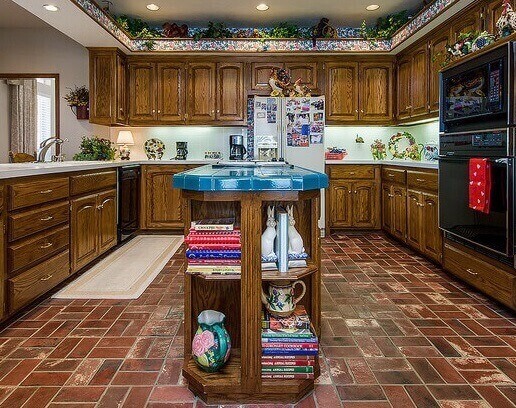 The underside has cabinets to store items of daily as well as seldom use. Take your island design to new heights with this modern oval layout. Combining adequate proportions with a striking color palette, this can become the kitchen island of your dreams. Place a couple of matching chairs along the sides and you can use this as a dining table as well. 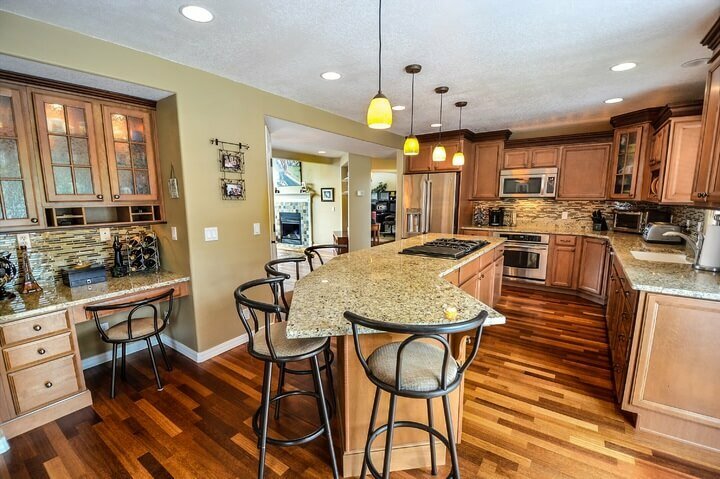 Perfect for large families, every inch of this kitchen island is filled with scope to serve as storage areas. 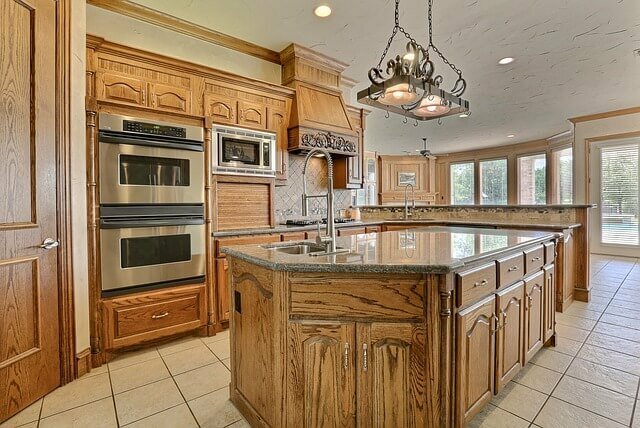 With so many roomy cabinets, you can stash seldom used items like roasting pans, big serving platters, and small appliances in the cabinets located further below. The upper drawers offer easy-to-access space for daily items. This worktable is a classic example of a cozy yet versatile workplace. We love the particular arrangement shown above — which combines a stand for placing a cookbook, a small area to keep some wine glasses, and workspace to do your chores. Imposing warmth, authority, and charm, it comes with installed pull-out drawers to keep goods of everyday use. The subtle blue of the cabinetry goes perfectly with the woody tone at the top. A wonderful design idea that blends storage and displays seamlessly in a single unit, this kitchen island features open storage– that houses pretty items and the closed cabinetry to hold more utilitarian items. What’s more? The entire look is enhanced by exposed beams on the ceiling which hold a suspended rack to hang decorative crockery and utensils — within easy reach. The complete setup lends a striking, elegant appearance to the area. Display your prized wine collection by storing the bottles in a wine storage unit and wine rack, located toward your kitchen island end. This arrangement shall keep your champagne safely organized and ready to pour. 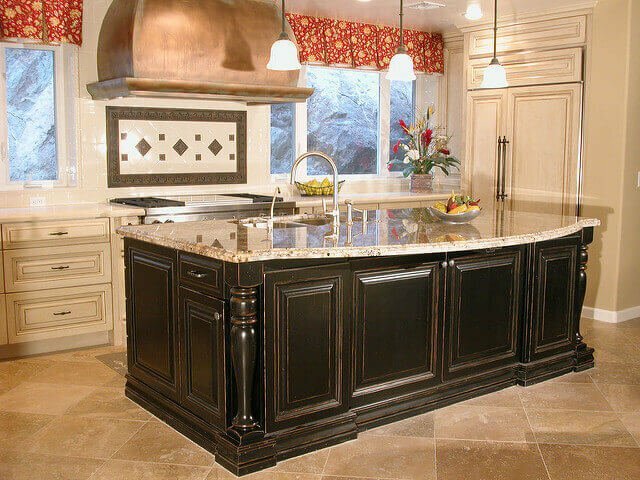 Note the sharp angular design of this particular island that features a dark walnut wood countertop. Coupled with refrigerator drawers to keep your champagne chilled, a prep sink, and large pull-out cabinets, this unit can easily accommodate a family of 5 in its seating area. 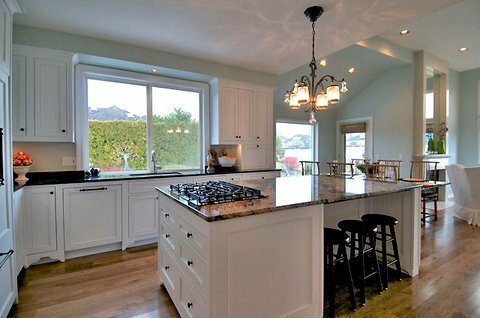 If you don’t have enough space and are due for a kitchen remodel soon, try out the above tips. The little nooks and crannies can turn out to be great space-savers. Do you have any similar ideas up your sleeve? Let us know in the comments below!